I’m thrilled to be part of Gallery 209! Beautiful art from talented artists working together to make it happen. Check out this video for an introduction and sampling of our art. We’re now located upstairs in the large, third floor gallery at the award-winning Artists & Makers 2 complex, at 12276 Wilkins Avenue, Rockville, MD 20852. Our current exhibit runs from January 31 – February 27, 2018. If you’d like to make an appointment to see my art, send me a message via my contact form. You’re invited to Janet Fox’s Featured Artist Reception in Gallery 209 on November 3rd; the show continues through November 28th. There’s more… on November 4th and 5th, come on by for the Open Studios Art Weekend, at Artists & Makers Studios 2 in Rockville. My challenge was to create a 3-D encaustic fedora for “The Wearable Hat Show,” curated by DC art collector Steven Krensky and a mystery juror. The show offered artists in the metro DC area a unique opportunity to make a statement through the art of the hat. 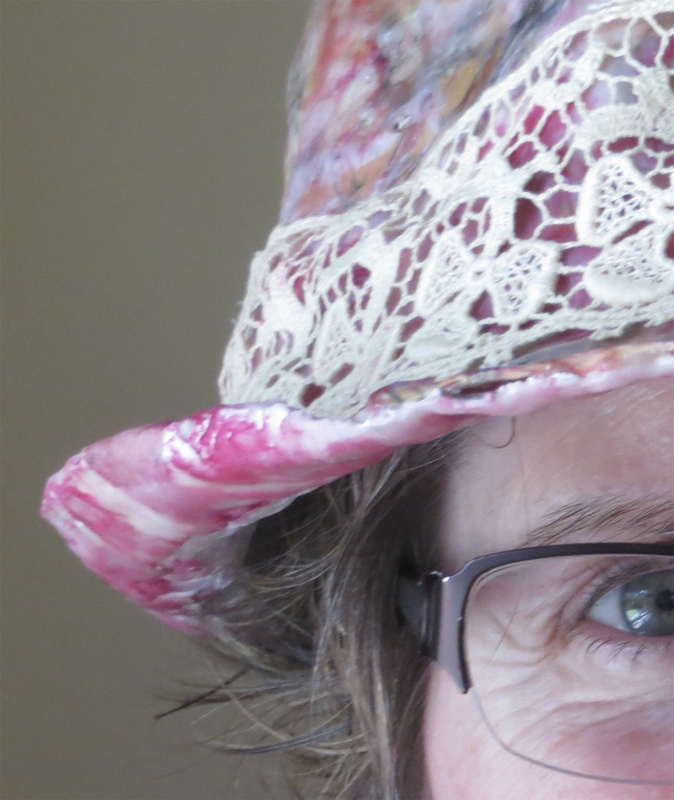 Since encaustic medium works the best for me when on a solid base, I built a plaster cast from a fedora. After the plaster cast dried and cured, I primed it with encaustic gesso and again let it dry several days. Then I applied a base layer of clear encaustic medium, then added colorful papers, encaustic paint, oil paint stick, and finished it with a few “hatless” lines of text from a French dictionary. I found a piece of grandma’s antique lace that was just right for a brim wrap, added my signature and voila, the “Hatless Fedora” was finished. “The Wearable Hat Show,” with 49 funky hats from regional artists, is on exhibit at the Artists & Makers Studios 1 and 2. 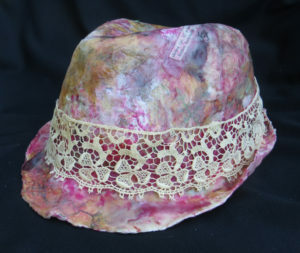 My encaustic fedora is at A&M 2 location, at 12276 Wilkins Avenue, Rockville, MD. The show opened Friday, September 8th, and continues through Wednesday, September 27th, 2017. Viewing hours are 10:00 AM – 4:00 PM, Tuesday-Friday, 10:00 AM – 4:00 PM Saturdays, and Sundays/Mondays by chance or appointment. ⇒ For information about purchasing this or a similar artwork, contact Janet Fox. The dreamer’s dreamscape… I’m in a big city, sometime during the daylight. I’m positioned high enough to see onto the flat rooftops of multi-story buildings. On one in particular, I see a small group of burly men working with vats of molten iron. The first man, with dark hair and closest to the roof’s edge, takes a shovel full of the hot liquid iron and puts it into the second vat. The man at this second vat then does the same thing, shoveling it into a third vat. The third man does the same thing again, into a fourth vat. Suddenly, my attention speeds back to the first man. As he toils away, a spec of the hot iron splashes on his arm and he thunders out a throaty roar as it burns him. Instantly angry, he throws a little blob of the molten metal from his shovel and over the edge of the roof. Instantly, my perspective changes and I’m down in the beautiful cool green park below. I see that the hot blob raining down has formed a small ingot as it cooled off. This ingot is orb-shaped and simultaneously also forms a small rectangle, which slightly protrudes from one side of the orb. The rectangle has a company’s logo on it, although I don’t recognize it. Exploring this dreamscape, I’m struck by the intense masculine energy on that flat roof. Big, burly men in repetitive, machine-like actions that no weak or refined person could, or would, do. This intense raw energy is a brute force to witness. But there’s not any particular end purpose, such as a molded metal object, for all of this doing. Or perhaps the purpose is to gradually cool off the hot metal. Pain and anger instantly spark, though, when the heat burns. The instinctive masculine energy cries out, forcefully throwing the molten iron away after it has hurt him. And he does so without regard to what, or who, might be below. As my dreamer’s perspective changes, so does the feeling. It’s almost tranquil in the coolness and greenery of the park below. The energy in this space feels much more feminine and nurturing. But in this park space, which could easily be full of playing children and their adults, people could be at grave risk of being hurt from above. My dreamer is thinking ahead, but thankfully, no one is in immediate danger. Reflecting on the raining hot metal reminded me of historic “shot towers” in our country’s early days. In the 1800’s, men built and used these towers, such as the Philadephia’s Sparks Shot Tower, to more efficiently make lead bullets for muskets. They dropped molten lead (not iron) from the top of the tower into cooling water below, forming round bullets. Hopefully, nobody below was hit by any of the cooling bullets! Iron is a curious part of this dream. Iron, by mass, is the most common element on Earth. We use iron, combined with other materials that strengthen it, for so many structures and objects. It’s also a critical component of our red blood cells, transporting oxygen throughout our bodies. 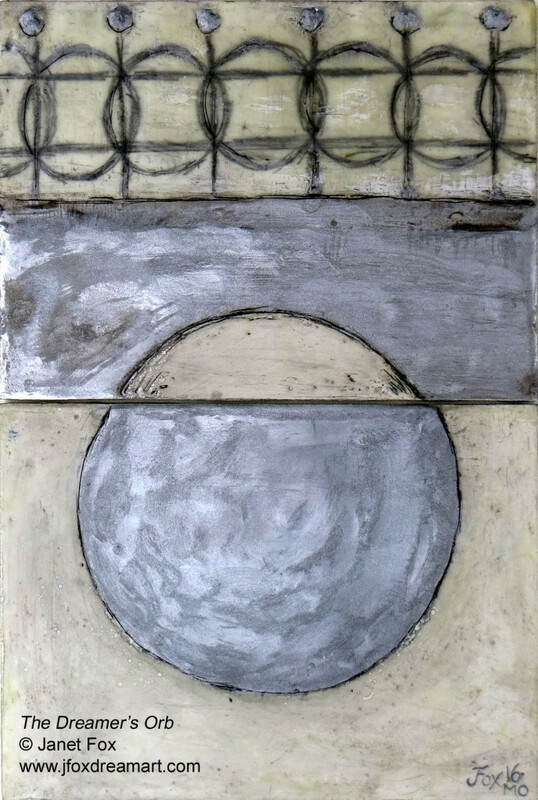 While creating this dream-inspired encaustic painting, I focused on finding harmony between masculine and feminine energies. Choosing simple lines, shapes and color palette felt right. I’m enjoying exploring this dream imagery and with many other ideas swirling in my head, The Dreamer’s Orb will be the first in an eventual series. This painting was also selected as the cover art for the spring 2016 issue of The Rose In The World. ⇒ For information about commissioning a similar artwork, contact Janet Fox.